NEW YORK (AP) — From the first practice in training camp until the last game, Brian Cushing was a tackling machine for the Houston Texans. That’s exactly what the team sought when it chose the linebacker from Southern Cal 15th overall in the draft last April. 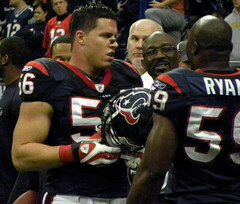 What the Texans also got is The Associated Press 2009 NFL Defensive Rookie of the Year. Cushing was a runaway winner in balloting by a nationwide panel of 50 sports writers and broadcasters who cover the league. Cushing received 39 votes Tuesday, easily beating Buffalo safety Jairus Byrd, who had six, and became the second Texans linebacker in four seasons to win the award. DeMeco Ryans took it in 2006.